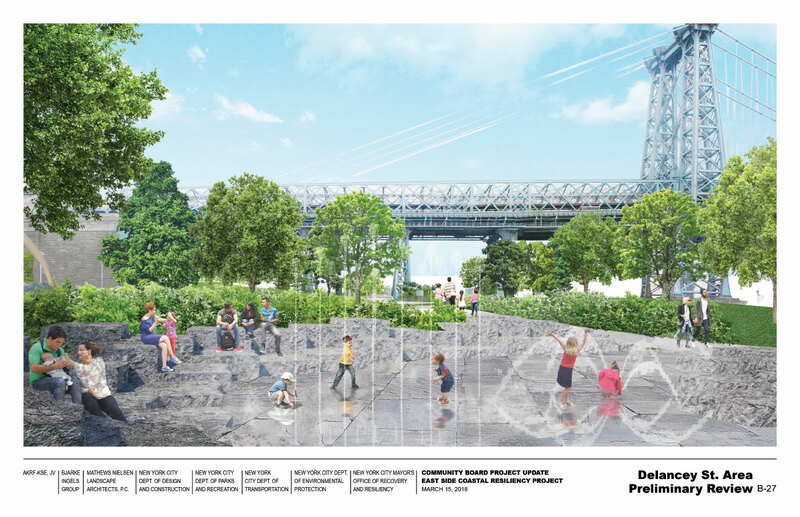 Ahead of a presentation before the full Community Board 3 (Lower East Side) tonight, March 27, planners from the East Side Coastal Resiliency (ESCR) Project have released new details and renderings for an updated “resilient park” along the shores of the East River. The Mayor’s Office of Recovery & Resiliency is hoping to receive approval for the snaking project before the end of 2018, though the combination of seawalls, berms and levees hasn’t pleased everyone. The updated concept, a joint venture between AKRF, One Architecture and Urbanism, the Bjarke Ingels Group (BIG), Mathews Nielsen Landscape Architects (MNLA), and several city agencies, was unveiled at a CB3 Parks Department meeting on March 15. The proposed park would stretch from East 25th Street down to Montgomery Street, and would fortify the existing green space, but also include new parks, lawns and nature walks. 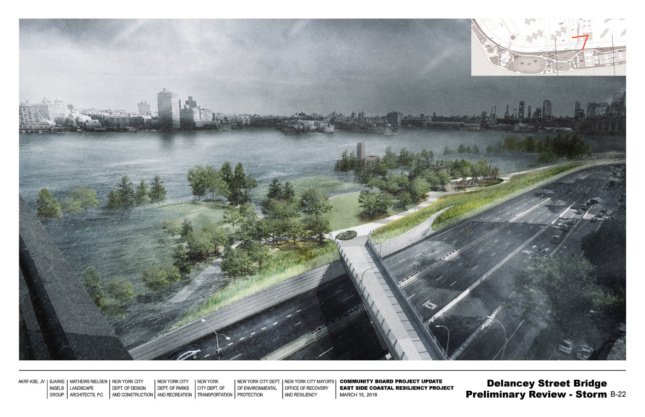 Rather than installing hard infrastructure that would block off the waterfront from the public, MNLA attempted to expand out the usable parkland where possible. 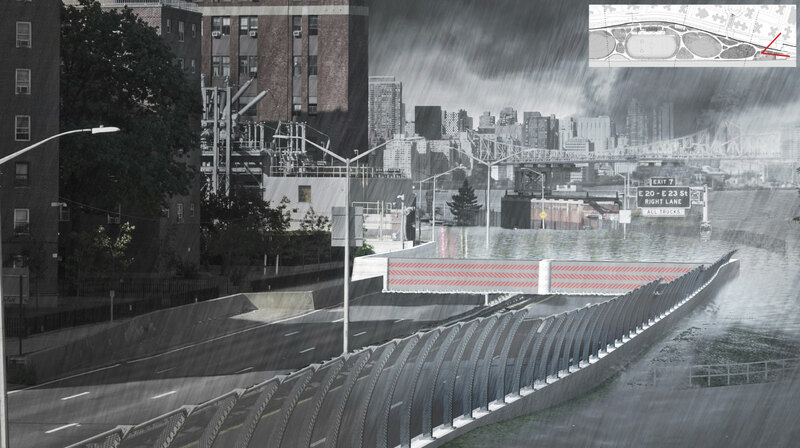 In the narrowest areas between FDR Drive and the East River, a flood wall gate would swing (or possibly slide) into action to cordon off stormwater. 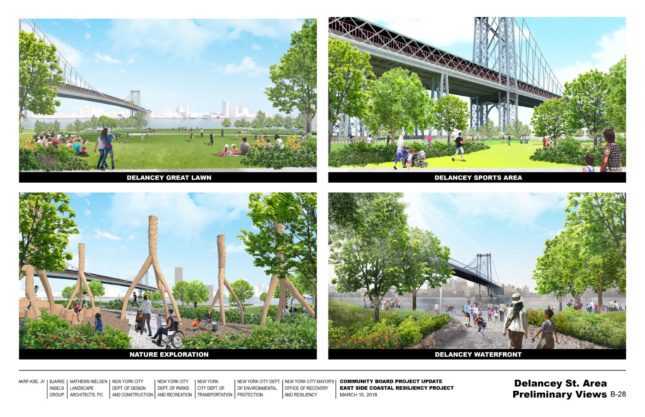 Several bridge upgrades have also been included, as well as new footbridges at Delancey Street and on 10th Street that would loop into the park. The approximately 2.5-mile-long stretch is just one part of what was once the BIG-U coastal resiliency plan (neé The Dryline), which has been broken up into the aforementioned ESCR and the Lower Manhattan Coastal Resiliency (LMCR) Project. The ESCR’s southern counterpart will stretch 3.5 miles, from the northern tip of Battery Park City to the Lower East Side’s Montgomery Street. Once completed, the entire system should be able to protect (though mitigate would be a more apt phrase) southern Manhattan from the likes of a 100-year storm. Time is quickly running out for the ESCR to reach approval and hit its accelerated 2019 groundbreaking target. The $335 million distributed by the U.S. Department of Housing & Urban Development (HUD) in the wake of Hurricane Sandy for the construction of the ESCR must be spent by September of 2022, and with the project a year-and-a-half behind schedule, the city is hoping to move through the Environmental Impact Statement (EIS) and ULURP process quickly. AN will follow up this post with more information about the outcome of tonight’s CB3 board meeting. The feedback gleaned from community boards 3 and 6 will help the city inform changes that they may need to make before presenting to the Public Design Commission in the coming months. The full March 15th presentation can be viewed here.